With the exception of documents that are created specifically for foreigners, one does not "sign" official documents by using a ballpoint pen to write a signature. Instead, residents of Japan (foreign and citizens alike) use a "hanko" (判子) to sign their official name. Your hanko is basically a stamp with your name carved into it which is stamped onto documents in red ink. The use of hanko dates back over 1300 years, but did not become available for "common" use until 1870 as it was previously used only by the Samurai class. Japanese people can usually purchase a ready-made hanko since many Japanese names are common throughout the country (just like "Smith" or "Johnson" is in the US). Foreign residents, on the other hand, will need to have one custom order-made. 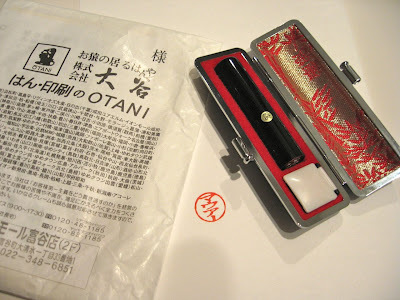 Hanko stamps are generally hand-made (or semi-hand-made) and all exhibit slight variation even for the same name. Additionally, each person has a slightly different style of stamping their impression (amount of pressure, tendency toward one side, etc). This makes a person's official stamp difficult to reproduce perfectly.